Bill Gates will announce the creation of a multibillion-dollar clean energy fund on Monday at the opening of a Paris summit meeting intended to forge a global accord to cut planet-warming emissions, according to people with knowledge of the plans. The fund, which one of the people described as the largest such effort in history, is meant to pay for research and development of new clean-energy technologies. It will include contributions from other billionaires and philanthropies, as well as a commitment by the United States and other participating nations to double their budget for clean energy research and development, according to the people with knowledge of the plans, who asked not to be identified because they were not authorized to discuss the fund. The announcement of the fund, which has the joint backing of the governments of the United States, China, India and other countries, the people said, is intended to give momentum to the two-week Paris climate talks. Negotiators hope to strike a deal committing every nation to enacting policies to reduce fossil fuel emissions. Mr. Gates, co-founder of Microsoft, will join more than 100 world leaders, including President Obama, in Paris on Monday to begin the talks. The pending announcement was first reported by ClimateWire, an online news organization. A spokesman for the Bill and Melinda Gates Foundation did not respond to a request for comment. If successful, the Paris meeting could spur a fundamental shift away from the use of oil, coal and gas to the use of renewable energy sources such as wind and solar power. But that transition would require major breakthroughs in technology and huge infrastructure investments by governments and industry. Where that money would come from has been a question leading up to the Paris talks. Developing countries like India, the third-largest fossil fuel polluter, have pushed for commitments by developed nations to pay for their energy transition, either through direct government spending or through inexpensive access to new technology. India has emerged as a pivotal player in the Paris talks. The announcement by Mr. Gates appears intended to help secure India’s support of a deal. As secretary of state, Hillary Rodham Clinton pledged that developed countries would send $100 billion annually to poor countries by 2020 to help them pay for the energy transition. Indian officials have demanded that the Paris deal lock in language that the money would come from public funds — a dealbreaker for rich countries. 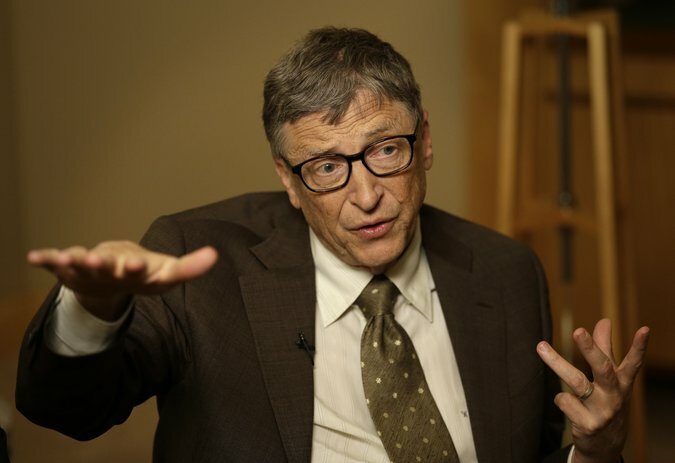 This summer, Mr. Gates pledged to spend $1 billion of his personal fortune on researching and deploying clean energy technology, but the people with knowledge of his plans said the new fund would include larger commitments. Mr. Gates met with Prime Minister Narendra Modi of India in September on the sidelines of the United Nations General Assembly meeting in New York. In a June meeting in Paris, Mr. Gates told President François Hollande of France that the Paris deal should include robust provisions on clean energy research and development. “Bill’s been making that point for years, and he’s going to make it more emphatically in Paris,” said Hal Harvey, chief of Energy Innovation, an energy consultancy. Mr. Harvey noted that at the core of the emerging Paris agreement are plans and pledges already put forth by more than 170 countries detailing how they will reduce emissions. “If you tote up the plans, you see a very significant demand signal, and Bill wants to see that we meet that cheaply,” he said. The year’s most notable embarrassments in technology run the gamut from the industry’s inability to secure our personal data to the blunders of Airbnb, Twitter and Tinder. Thanksgiving is almost here, but a look at this year’s list of tech turkeys may stir up memories of Halloween. It’s scary just how vulnerable we are. In 2015, hackers went to town with seemingly nonstop breaches. Anthem, the big health insurer, fell victim to the theft of personal information of 80 million customers and employees. That’s one out of every four Americans. Meanwhile, the identities of 30 million would-be adulterers were revealed after hackers got into Ashley Madison, the cheat-on-your-spouse website. Companies also had a frightening habit of tripping over themselves. Airbnb insulted its hometown of San Franciscowith a billboard campaign that appeared to gripe about paying the taxes it owed for short-term rentals in the city. Sean Rad, CEO of dating-app maker Tinder, meanwhile, demonstrated surprisingly poor knowledge of the English language. Volkswagen gets a special mention for gaming fuel-emission tests via the software in its cars. And BlackBerry, long proud of going its own way, finds itself pinning its comeback hopes on a phone that leans heavily on software from another company, Alphabet’s Google. Lastly, all of Silicon Valley gets a turkey this year because the tech industry still can’t figure out how to hire, retain and promote more women and minorities. Since innovation apparently can mean figuring out new ways to screw up, we’ve rounded up a supersized 17 examples of the most cringe-inducing tech turkeys for your holiday entertainment. 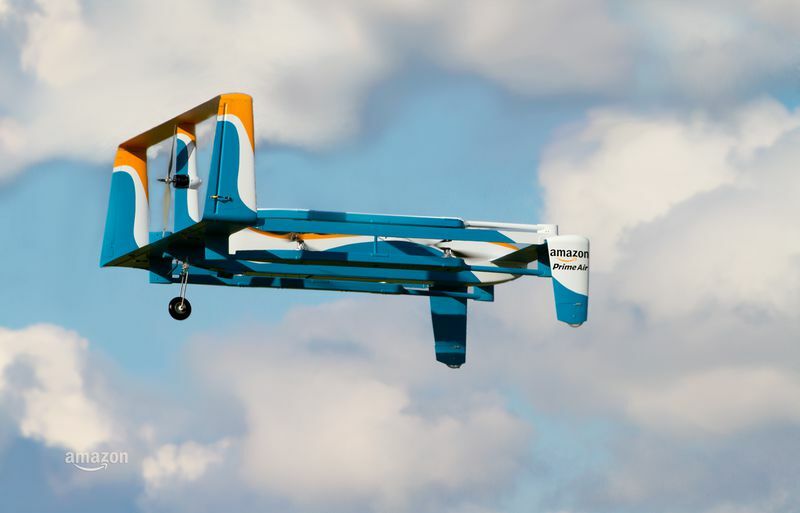 Amazon is back with its latest vision for its Prime Air drone delivery system — and this time the company has brought its high-profile celebrity, TV show host and gearhead Jeremy Clarkson, along for the ride. In a slick new ad and FAQ page published today, the company demonstrates what Prime Air could look like if and when regulators approve deliveries by unmanned aerial vehicles. This isn’t the only drone Amazon is working on. The spokesperson notes that “It is one of many prototype vehicles we have developed” and Clarkson adds in the commercial that “In time, there’ll be a whole family of Amazon drones; different designs for different environments.” In this demo, it appears customers will set up a little landing zone in their backyard that the drone can sense and land on to deliver the package. The other details of this delivery system remain the same however: Amazon is pushing the FAA to allow it to use airspace below 400 feet to deliver packages weighing less than five pounds to houses 10–15 miles from warehouses. Clarkson is also sure to note the drone’s safety features, which include Amazon’s proposed “sense and avoid” technology. Since there are too many drones for air traffic controllers to handle, such a system would allow drones to theorhetically avoid obstacles and other aircraft on their own. The whole process from order to delivery is supposed to take less than 30 minutes, but it faces many, many regulatory hurdles before it can become a reality in the US. The company itself notes that “putting Prime Air into service will take some time, but we will deploy when we have the regulatory support needed to realize our vision.” A spokesperson also adds, “One day, seeing Prime Air vehicles will be as normal as seeing mail trucks on the road.” It’s likely this highly-produced ad is meant to turn up public pressure on the FAA so Amazon can bring its dream drone delivery system to life. Deliveroo has raised $100m (£66m) from a group of venture capital funds including Facebook investors Accel and DST Global to fuel the London-based food delivery start-up’s international expansion. The funding round is Deliveroo’s third this year, bringing its total capital raised in the past 12 months to $195m. Will Shu, chief executive, said the investment would fuel the company’s expansion to Dubai, Hong Kong, Singapore, Melbourne and Sydney. “This is our first foray outside Europe. We’re now very much a global company and that’s significant,” said Mr Shu, a former investment banker who founded the company alongside software developer Greg Orlowski in 2013. The Series D funding round was led by Yuri Milner’s investment firm DST Global – which has backed Twitter, Spotify and Airbnb – and San Francisco-based Greenoaks Capital. Deliveroo also raised funds from existing investors Accel, Hummingbird Ventures and Index Ventures, whose portfolios include Facebook, Asos and King Entertainment. In addition to its international expansion, the Soho-based businesses will ramp up its marketing and hiring activities to increase its presence in its current markets amid strong competition from other food delivery technology companies such as Just Eat and Hungry House. Deliveroo differs from its rivals because it connects users with high quality restaurants, from Michelin-starred establishments and independent eateries such as Trishna and Dishoom to upmarket chains including Wagamama, Dirty Burger and Busaba Eathai. “There’s been a big boom in premium casual dining across the world over the last 10 to 15 years,” Mr Shu said. “In 2001, Paris was either Michelin-starred restaurants or kebab shops, and London wasn’t that far off. Deliveroo’s daily orders have increased 10-fold since January, when the company took its first step beyond London and opened in Brighton. It has since expanded outside of the UK, launching first in Dublin in April and then branching out into another 19 European cities. Online transactions now account for 40pc of all food delivery orders in the UK, up from 8pc in 2008, according to the market research firm NPD Group. Just Eat, the online food ordering service that launched in 2001, raised £1.47bn when it listed on the London Stock Exchange last year in the UK’s largest technology flotation in eight years. Jeff Bezos’ privately-funded space company Blue Origin announced a historic first today – it successfully landed a fired rocket back on Earth after an unmanned flight to space. In this test flight, the rocket separated itself from the New Shepard vehicle, which flew to an altitude of 93km on Monday, at almost 4 times the speed of sound. In this case, it was guided towards a launchpad on Earth where it slowed down and landed, intact. This means the rocket can be re-used for subsequent flights, which companies like Blue Origin claim will make spaceflight far less expensive. Bezos told the Wall Street Journal in an interview that he planned to start commercial suborbital flights with tourists potentially in less than two years. “I’m thinking it could be sometime in 2017,” he said. But not everyone was as triumphant about the event. Rival space entrepreneur and billionaire Elon Musk responded on Twitter saying it wasn’t really that rare, linking to his own SpaceX Grasshopper rocket which has done multiple flights – although it hadn’t gone as far as Blue Orbit’s 93km distance. He then went on to Tweet from his own account about the distinction between space and orbit, and why getting into orbit was a lot harder than reaching the edge of space. Mr Musk’s private space transport company SpaceX has also beenattempting to land its Falcon 9 rocket but has failed to do so yet. In June, it exploded after lift-off. Earlier this month, SpaceX was awarded its first Nasa contract to deliver astronauts to the International Space Station. While smartphone sales reached their highest figure on record during the third financial quarter of 2015, growth in Europe stalled as user demand slowed, a new report has found. Smartphone unit growth across Western Europe saw a rise of around 3pc year-on-year during the quarter, with the French market slowing to 5pc growth and the UK declining by 1pc, according to a report by GfK, which is based on consumer ‘point-of-sale’ data. Growth was marginally higher in Eastern Europe at 4pc, where Russia and Ukraine’s declined by 6pc and 19pc respectively. The report predicts a lift in demand in central Europe, forecasting an upturn of 4pc in the year’s final quarter, before rising to 9pc growth in early 2016. Elsewhere in the world, growth was particularly strong in emerging Asian Pacific (APAC) countries including India, where sales rose by 40pc year-on-year – driven by strong demand from smartphone priced at $100 and under, which accounts for around 48pc of the market. Over in China, mid-range and high-end smartphones were the drivers behind increased growth of 6pc overall. Sales of high-end handsets, defined as such by their $500 upwards price tags, which include Samsung Galaxy S6 flagship and Apple’s iPhone series, rocketed 65pc, while sales of more modestly priced mid-range units rose 25pc year-on-year. Separately conducted research from Gartner found that smartphone sales fell for the first time during the second quarter of the year in the face of the rapidly cooling economy, falling by 4pc. GfK predicts overall smartphone market growth in China will fall 4pc throughout 2015, before rising to a modest 3pc growth in 2016. Unit demand in South Korea, home of Samsung and LG, fell 3pc compared to the same time a year ago, while Argentina and Brazil reported respective declines of 16pc and 15pc. By the end of 2015, GfK estimates 1.3bn smartphones will have been sold, bolstered by a 13pc global sales rise in the fourth quarter. The company’s diversity efforts suffer a setback due to cuts at overseas factories where a high percentage of women held jobs. Despite Microsoft’s efforts to increase employee diversity, women make up a smaller percentage of the company’s workforce than they did a year ago. Women made up 26.8 percent of the company’s global workforce at the end of September, a drop from 29 percent a year earlier, Microsoft said in a diversity report released Monday. The decline was due to layoffs from the restructuring of the phone businesses Microsoft acquired from Nokia last year, Gwen Houston, Microsoft’s general manager of global diversity and inclusion, wrote in the report. As part of the restructuring, the company eliminated many manufacturing jobs at factories outside the US. Those jobs were held by a high percentage of women, she said. Like most large tech companies, Redmond, Washington-based Microsoft continues to grapple with how to increase diversity in its workforce. From Facebook to Google to Twitter, some of the largest technology companies in the world have confronted the problem by starting programs aimed at increasing the number of women and minorities in the workplace. On average, 30 percent of the tech industry workforce is female, even though women make up 59 percent of the total workforce and 51 percent of the population, according to US Census Bureau data. Microsoft is among a handful of major tech companies participating in initiatives unveiled in August by President Barack Obama to close that gap. In a new company mission statement released in June, Microsoft CEO Satya Nadella noted the company’s ongoing diversity initiatives, a topic that made headlines last year when the CEOimplied female employees shouldn’t ask for raises but should instead trust karma. Despite the decline in the percentage of women employed at Microsoft, there are signs the company’s diversity efforts are paying off. Microsoft said that women now make up 27.2 percent of senior leadership team, the highest it’s ever been. The company also said that 30.6 percent of hires from universities are women, up from 27.7 percent the previous year. “While certain leading indicators are trending up and we are starting to see signs of progress, systemic challenges remain when it comes to increasing the presence of women and minorities at all levels of the workforce,” Houston wrote. Minorities also saw modest increases in the company’s makeup. Of the 115,905 people employed by Microsoft worldwide, blacks made up 3.5 percent of the workforce compared with 3.4 percent a year ago. Latino employees increased to 5.4 percent from 5.1 percent a year earlier, while Asians made up 29.3 percent of the company, up from 28.8 percent. Nvidia may have unveiled bits and pieces of its Pascal architecture back in March, but the company has shared some additional details at its GTC Japan technology conference. Like AMD’s Fury X, Pascal will move away from GDDR5 and adopt the next-generation HBM2 memory standard, a 16nm FinFET process at TSMC, and up to 16GB of memory. AMD and Nvidia are both expected to adopt HBM2 in 2016, but this will be Nvidia’s first product to use the technology, while AMD has prior experience thanks to the Fury lineup. HBM and HBM2 are based on the same core technology, but HBM2 doubles the effective speed per pin and introduces some new low-level features, as shown below. Memory density is also expected to improve, from 2Gb per DRAM (8Gb per stacked die) to 8Gb per DRAM (32Gb per stacked die). Nvidia’s quoted 16GB of memory assumes a four-wide configuration and four 8Gb die on top of each other. That’s the same basic configuration that Fury X used, though the higher density DRAM means the hypothetical top-end Pascal will have four times as much memory as the Fury X. We would be surprised, however, if Nvidia pushes that 16GB stack below its top-end consumer card. In our examination of 4GB VRAM limits earlier this year, we found that the vast majority of games do not stress a 4GB VRAM buffer. Of the handful of titles that do use more than 4GB, none were found to exceed the 6GB limit on the GTX 980 Ti while maintaining anything approaching a playable frame rate. Consumers simply don’t have much to worry about on this front. The other tidbit coming out of GTC Japan is that Nvidia will target 1TB/s of total bandwidth. That’s a huge bandwidth increase — 2x what Fury X offers — and again, it’s a meteoric increase in a short time. Both AMD and Nvidia are claiming that HBM2 and 14/16nm process technology will give them a 2x performance per watt improvement. Historically, AMD has typically led Nvidia when it comes to adopting new memory technologies. AMD was the only company to adopt GDDR4 and the first manufacturer to use GDDR5 — the Radeon HD 4870 debuted with GDDR5 in June 2008, while Nvidia didn’t push the new standard on high-end cards until Fermi in 2010. 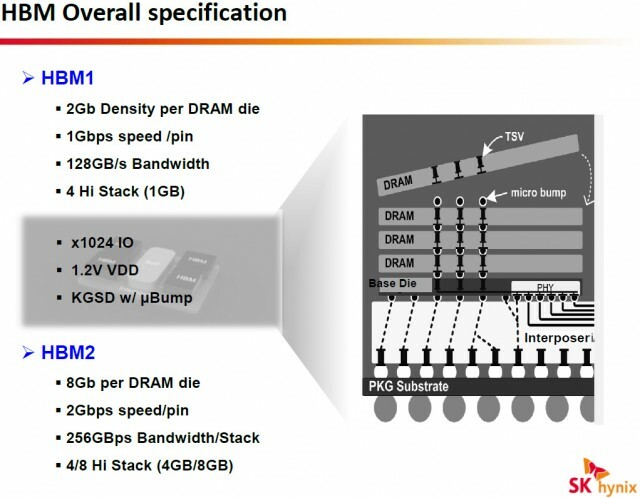 AMD has argued that its expertise with HBM made implementing HBM2 easier, and some sites have reported rumors that the company has preferential access to Hynix’s HBM2 supply. 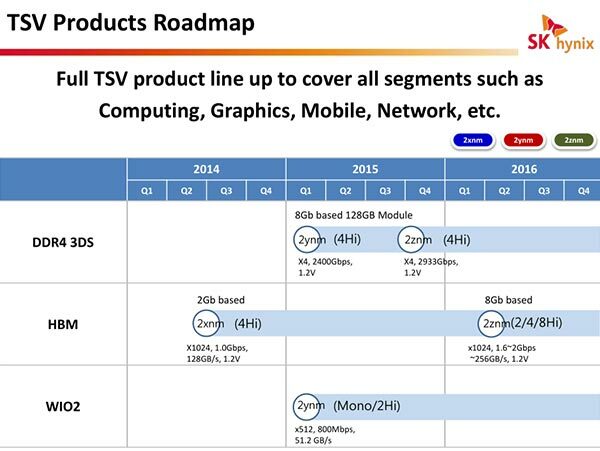 Given that Hynix isn’t the only company building HBM2, however, this may or may not translate into any kind of advantage. With Teams Red and Green both moving to HBM2 next year, and both apparently targeting the same bandwidth and memory capacity targets, I suspect that the performance crown next year won’t be decided by the memory subsystem. Games inevitably evolve to take advantage of next-gen hardware, but the 1TB/s capability that Nvidia is talking up won’t be a widespread feature — especially if both companies stick to GDDR5 for entry and midrange products. One of the facets of HBM/HBM2 is that its advantages are more pronounced the more RAM you’re putting on a card and the larger the GPU is. We can bet that AMD and Nvidia will introduce ultra-high end and high-end cards that use HBM2, but midrange cards in the 2-4GB range could stick with GDDR5 for another product cycle. The big question will be which company can take better advantage of its bandwidth, which architecture exploits it more effectively, and whether AMD can finally deliver a new core architecture that leaps past the incremental improvements that GCN 1.1 and 1.2 offered over the original GCN 1.0 architecture, which is now nearly three years old. Rumors abound on what kind of architecture that will be, but I’m inclined to think it’ll be more an evolution of GCN rather than a wholesale replacement. 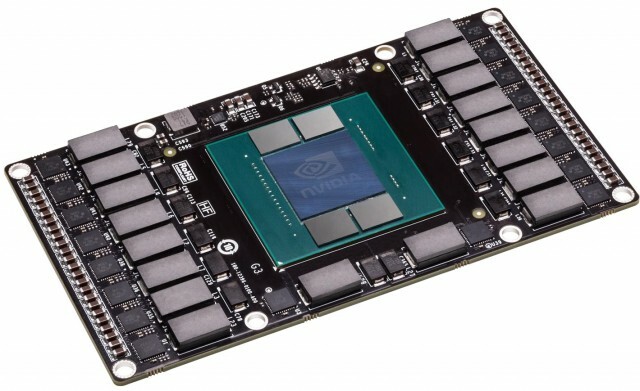 Both AMD and Nvidia have moved towards evolutionary advance rather than radical architecture swaps, and there’s enough low-hanging fruit in GCN that AMD could substantially improve performance without reinventing the entire wheel. Neither AMD nor Nvidia have announced a launch date, but we anticipate seeing hardware from both in late Q1 / early Q2 of 2016.